Located Just West of I-95 on Gateway Blvd. Go west on Gateway Blvd. (Exit 59)For approximately 1/2 mile. 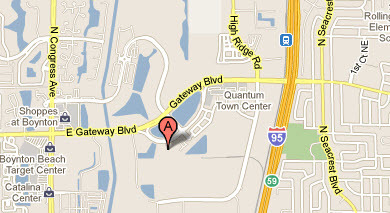 Turn left on at traffic light on to Quantum Blvd. Go one block and turn right. You’ll see 2, one-story office buildings on the leftMake a left between the two buildingsMake another left into the parking lotQuantum Business Centers is building 2,in the left corner, Suite 203.